Gauge, generally ranging from 3-10, is the measure of thickness for PVC (Poly-Vinyl) and other plastics. An 8 Gauge thickness is extremely durable and designed for heavy use. Lovely product and quality. This company is by far the best in the industry. Look no further than CEP. Brought these promotional clear totes to my latest convention and everyone loved them. They asked if I can bring more next time I go. Really appreciate the business. Handed these bags out as a holiday gift to help promote my business and it worked out wonderfully. Business is growing since then and I couldn't be any happier. Thank you. Placed an order for 5,000 bags. Bringing them to my next convention to help promote my business. These bags were so great for my company outting! Everyone loved them and asked if I can order more! Thank you Custom Earth Promos I will be ordering a lot more now! I placed my order with Custom Earth Promos for 5K eco-friendly bags. They were delivered faster than I could have ever expected. I have high standards and I must that the quality of the bags met those standards, and actually exceeded them. Thanks Cory for the impressive product and your knowledge in this industry! Love the product and quality. Love this bag, I ordered my a few of my clients and they were very pleased. Was very impressed with my overall experience with Custom Earth Promos. Will definitely be ordering again. Great idea for all us that frequent sporting events. Makes life a lot easier. Great product that made all the events we attend easier. Purchased these bags for everyone in our fan club so getting into the game is much easier now. We have season tickets to the Texans, and having to take the time to have all our bags checked can be a tedious process. Since ordering these clear totes for everyone, life has been made so much easier. Very useful to our fan club. Our employees are constantly traveling. We thought it would be a great idea to give all of them these clear totes to make life easier. They were much appreciated. Needed 7,500 of these promotional game day totes for everyone that has season tickets. Such a convent item for us and it helps the earth by being recyclable too. 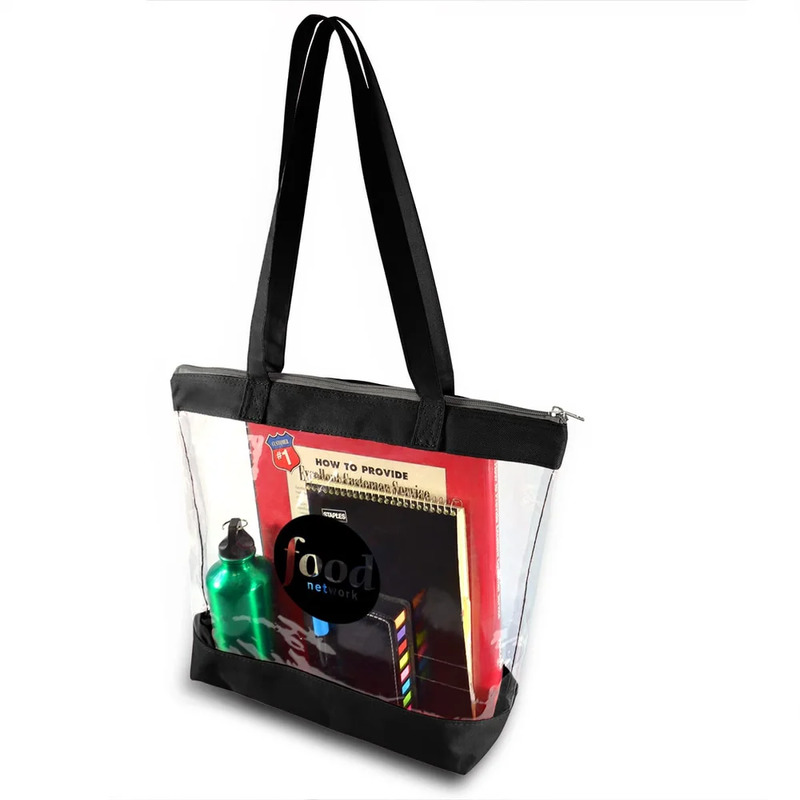 Make a fashionable and responsible statement with Promotional Game Day Clear Totes from Custom Earth Promos. Made with transparent PVC, this bag meets all the regulations for security bags in both size and clarity of the film. This bag has an open top for easy access to its contents. Measuring 16" x 12" with 4" gussets, this bag is perfect for sporting events, picnics, the beach and many other daytime adventures. Strong enough to securely hold several items and protected with zipper closure, Custom Earth Promos' clear totes are strong, sturdy and stylish. 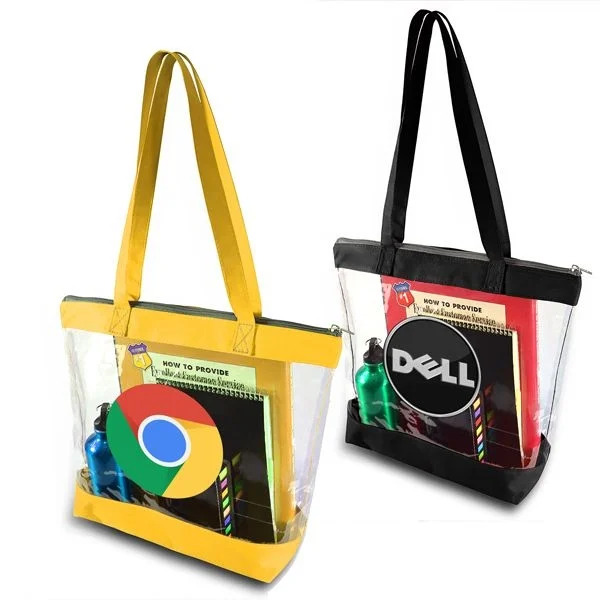 These eco bags are also recyclable, communicating to your target demographic a brand-wide investment in preserving the environment and solidifying the eco-responsibility of your brand. Meet the Promotional Game Day Clear Tote. In a stadium filled with roaring fans, sporting this stylish clear bag will make you stand out from the crowd any day. Clear totes have been a trending promotional accessory, and Custom Earth Promos' has formulated a strategy to make sure your brand obtains optimized visibility and an increase in exposure. The Game Day Clear Tote gets its name from its unique usability tactic that makes it so popular. These totes allow for easy screening at stadiums. With the help of this handy tote, your belongings don't have to be spilled all over a dirty table and it doesn't take such a long time to get past security and grab your seat. Once you have your brand logo emblazoned on its front, it will automatically garner the attention of other fans at these sports stadiums, making you the talk of the town. Furthermore, these bags are designed to be recyclable, which makes them eco-friendly as well. It won't be long before audiences relate with you as being ethical and responsible, in turn reflecting positively on your brand image! Fully equipped with all the right design elements to leverage its usability to the best of its effects, the Promotional Game Day Clear Totes are the most stylish strategy for getting past stadium security screenings. With a simplistic and sheer design, this bag is neatly compartmentalized to allow the user to hold all the necessary items with ease. Its eco-friendliness enhances its likability factor further, making it the perfect platform for your brand promotions! You also take a virtuous step toward preserving the earth by deploying these bags as your brand's promotional accessories. Customization is at its best when your work with our in-house expert design team. We also welcome clients who need additional assistance on functionality aspects, artwork requirements or customizations. Our team will guide the artwork design aspect of your customized bag, ensuring it genuinely captures your brand message. We're often faced with situations where clients come in and ask us for a speedier delivery, sometimes in under five days' time on large orders. We're proud to say that we've furnished many such orders in lighting speed so that their promotional events don't face a delay. If your organization has an event lined up and is without a stunning promotional accessory to win you laurels, you know you can always rely on us for quality promotional totes that arrive right on time!